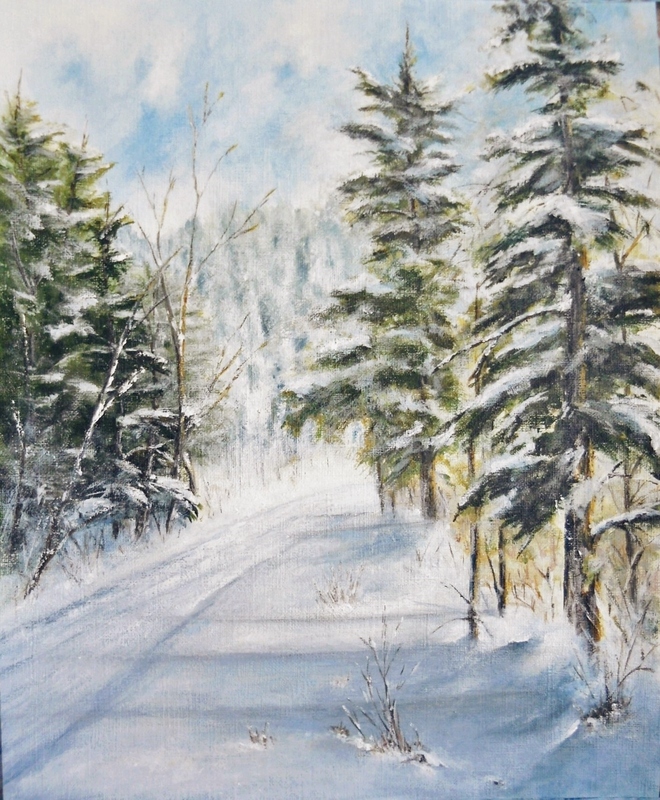 This entry was posted in Acrylic Paintings and tagged acrylic, art, fine art, painting, path, snow, trees, winter. Bookmark the permalink. Thank you Sunayna, I really appreciate it . Your talent has always been obvious but your skill grows and grows. Congrats, dear Mary. Cynthia, you know how to make my day . thank you for your kind comment and compliment . Beautiful! I can feel that crisp winter air. I really like the shadows of the trees across the road. Thank you Ruth and also for noticing the shadows . This painting was a great exercise for trees and snow. Love your winter scene, excellent! Thank you so much Robert, good to see you again. Snow is the magical part of winter, wouldn’t you agree? It’s the numbing cold that gives it a bad rap. I like the warmer days we have down here in Texas. 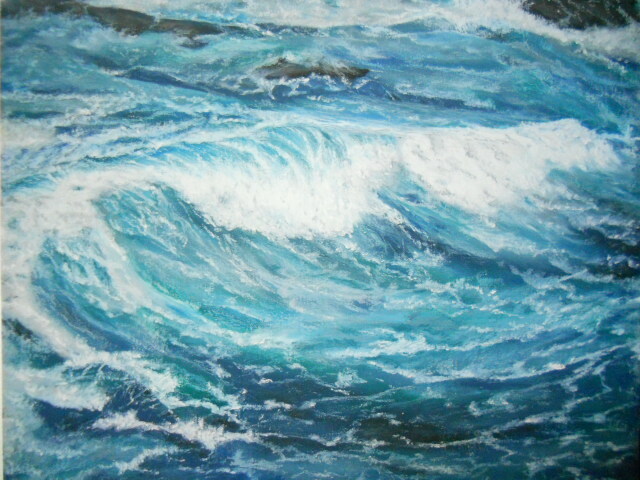 Thank you for your generous comment on this painting – always appreciate it. First daffodil came up today ~ Spring is definitely in the air. Even if belated, that is a wonderful image for a ‘winter’ card… ha, it would work for a visual relief from the heat of summer as well! that’s probably hard to imagine right now with the extreme cold temps sweeping thru the country. As beautiful as snow – and even an ice storm – can be, I am happy in that type of climate for about half a day.. i am always thankful that temps don’t get below 60 here near the coast – and rarely do they reach 90…. Great to see you Lisa, I’ve been wondering how your exhibition went – I can imagine it being highly successful considering your work and reputation. Wish I could have been there to see it. I hope to get over to your blog and see if you posted any photographs from the event. Winter, they can keep the cold – but let the beauty of a fresh snow fall shine through. Thanks so much for taking time to stop by and say hello. I’ve been missing, but am going to try to get online a little more often. Very well received, but zero sales.. now i’m glad, as there are two more shows, so the inventory for a strong show is already ‘in hand and framed.’ now just a few more to make it stronger! Glad to see you back…was concerned. Thank you and happy to be back. Appreciate it, thanks for checking in . Wonderful to see you again Marina. Happy new year to you as well. Thank you for your kind words and checking in. I’m looking forward to see what you have been up to. Thank you my friend . Such a gorgeous Yuletide scene, Mary. So evocative. I can almost hear the squeak of snow under my boots as I step into your winter woodland. Maybe I’ll find a log cabin ahead, with a welcoming glow at the window, cheery faces at the door, and a roast turkey ready for carving! My very best for 2019. Wonderful to see you Paul and Happy New Year to you and Maureen – best wishes also for a creative year. Thank you for your response to this painting, your imaginative words bring magic to the scene. Love it ~ thank you and I look forward to seeing your latest works. Hey Resa great to see you . Thank you my friend for your generous words of encouragement . Happy new year to you and best wishes for a creative year in fashion fantastics !! Thank you Wesley for your generous comment – much appreciated . Oh so good to see your work again Mary! This is just spectacular. I can see myself right there. I miss the snow. It’s been so mild here in NJ. Your painting gives me a little winter lift as to the beauty of a winter snow fall. Thank you! Awesome to see you Catherine , loved your reaction to the painting. Great to be back and can’t wait to see your latest paintings. Thanks so much. Thank you Joe, much appreciate your stopping by. For the fine branches I used a 0/0 Liner brush – I load the brush fully (laying it down and sliding it flat across a puddle of paint). When I apply it, it’s with the slightest of touch and one long stroke (the brush is sort of angled, not flat across the surface nor positioned straight up). The liner bush gives a nice thin line. For me, it is more difficult to get a fine line with round or flat brushes, although I have gotten some thin lines with the side-edge of a flat brush. Use a piece of scrap paper and practice loading the brush and the amount of pressure you apply. Hope that this helps. I’m still learning, so it’s a real compliment that you would ask me ~ thank you. Well, the problem is not you – I am still figuring it out. You would be surprised at how liberating a piece of scrap paper can be to practice on 😄. Thanks and you are welcome! Good to see you again GP. Thanks very much for your kind comment – means a lot and is appreciated. I just found your comment in spam ~ glad I didn’t miss it. I don’t know why that happens, but every so often one of my regular readers ends up in the Spam. So good to see you Derrick – best wishes to you and the head gardner for a wonderful 2019 filed with gardens of brilliant colors and foliage!! Thank you for your kind words on my latest. I have missed seeing your art Janet and the wonderful photos of your classes. Happy New Year to you as well and thank you for always being present and so encouraging. I’m really enjoying painting with acrylics ~ looking forward to seeing your beautiful hummingbird paintings. Thank you Mary and here’s to a year of much creative productivity for both of us ….. Thank you and yes indeed. Happy New Year! Lovely artwork. A reminder of our Canadian winters!!! Happy New Year too!! Thank you so much for your response! Oh my, you guys do get some pretty cold winters, especially this year. Hope you are staying warm. Hi Pegi , so good to hear from you . Thanks so much for your nice feedback- yeah it reminds me of Upstate NY too. Glad it brought back some memories for you . Love you too ! Thank you Rose Elaine for your nice response, it means a lot. Ohhh! What a wonderful scene, the perfect Christmas card indeed. Nicely done! Glad to see you back, Happy New Year to you as well. Thanks so much Isabel, good to see you as well – hope you have had time to be creative . Thank you for your kind words – I really appreciate it . Nice post card, I really like your path. that I’ll be starting will be a good workout in that regard . Thank you for your comment and especially about the path. I don’,t know how I lost you but so glad to see your beautiful work again! Hope you are surviving this winter. Great to see you Dorann. Thanks so much for your generous comment – always appreciated ! So happy to see your beautiful work again. I hope you are doing well and staying warm this winter. Thank you Takami for your warm welcome and kind words . It’s great to see you . I really appreciate it and hope you have a wonderful 2019. Looking forward to seeing your latest photography. Thank you Ashokbhatia for your kind response – I always appreciate it. Hi Judy, great to see you ! Thank you so much – New Hampshire is also a special place in the winter. Beautiful painting, Mary! I drove through parts of Maine last fall, and I can see how the winter landscape would have been through your painting. Oh I envy you with the trip to Maine – nothing like it . thank you so much Hen for your response and kind words. I’m looking forward to seeing your latest photographs . Thank you Sylvia for both your kind words and thoughts of this year. I’m looking forward to seeing what you have been up to . So glad to see another painting. Wow I can hear the sleigh bells ringing. Love your reaction June – great to hear from you . thank you so much. I owe you a note. How lovely,Mary. I can feel the cold, yet the trees bless me with a warm glow. Hi Patricia, such a beautiful compliment- thank you so much. I always enjoy hearing from you. Hope you are well and happy new years . Happy New Year Mary ☺ This painting is lovely. Thank you so much Susan – great to see you again. And Happy New Year back to you my friend. I can only imagine how much painting you have done, looking forward to visiting!